"Herewith, an Englishman's account of life and death in the West..." John Dehner stars as J.B. Kendall, a British reporter for the London Times who writes and fights his way through the Wild West. He is an outside observer of outlaws, a chronicler of cowboys, but as a British Army veteran and a man with a gun, "he lives and becomes a part of the violent years in the new territories." Roaming the territories in search of "colorful and unusual accounts," and his notoriously delayed paycheck, he has regular brushes with both the famous and the infamous. 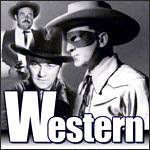 This fine series came to radio in 1958 and stands as the only serious rival to Gunsmoke in the "adult-western" radio Hall of Fame.